For those interested in Radio Controlled Aircraft. 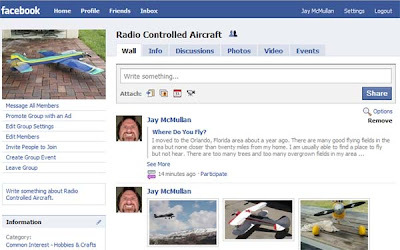 I have just started a new Facebook group for anyone interested in Radio Controlled Aircraft. Click Here to check it out. It is open to everyone! Make friends with other people that are interested in Radio Controlled Aircraft. Let people know where they can fly in their area and meet other pilots and people who are interested in Radio Controlled Aircraft. Share tips and tricks for building, flying and maintaining Radio Controlled Aircraft. Let people know about upcoming events in the Radio Controlled Aircraft community. Share your thoughts and ideas about Radio Controlled Aircraft. Brag on your Radio Control Aircraft and share photos with each other. Come on by and join me and other Radio Controlled Aircraft enthusiasts and let your friends know about the group! My Float Plane is Ready!! !